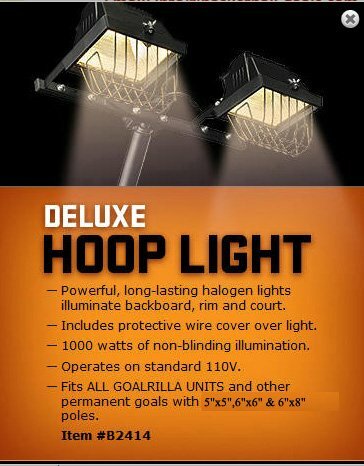 Goalrilla basketball court light is perfect for illuminating your backyard basketball court. Simply connect the basketball goal light to an extension cord for night play! At Goalrilla, we know how important basketball court lighting is when that late afternoon game stretches into the night. So, we developed a basketball spotlight that lights the court, NOT THE PLAYERS' EYES. Our Goalrilla basketball hoop light design is patented. That means it's the only basketball hoop light that extends out and over the court. This allows the light to flood the court and not shine into the players' eyes when shooting or rebounding. No other basketball hoop light has what it takes to be a Goalrilla.